We are pleased to announce that Susan Levine is our Caregiver of the Month! Susan has been an integral part of the Seniors Helping Seniors team for the last 1.5-years. She is originally from Maine and moved to North Carolina to be close to family. We were so lucky and fortunate to meet Susan just when she was looking for enrichment in her life. Susan is purposeful in her interactions and always has her client’s best interests in mind. She nurtures these relationships by going out of her way to meet their needs and always looking for ways to enhance the time she spends with each client. She brings Elvis movies to two of his hugest fans. She reaches out to clients on her own time, just because. She goes above and beyond to find out what is important to her client and engages them. 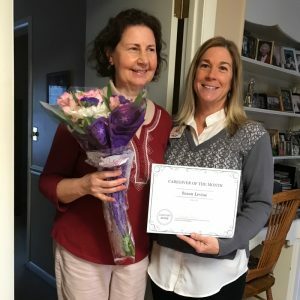 Watch Susan receive her Caregiver of the Month award! Susan’s warm and gentle heart is contagious with our clients as she develops an instant rapport and friendship which is at the heart of what we do. We love sharing stories of our heroes, the caregivers, whose life experiences coupled with their passion and desire to help, make Seniors Helping Seniors of North and East Raleigh a leading provider of compassionate and relationship-based senior care. If you would like to start your own story, visit seniorcareeastraleigh.com for more information. What Does it Look Like When Your Senior Is Less Involved? Why Do Seniors Get Restless Leg Syndrome?